Westminster Abbey has been confirmed as the wedding venue for Prince William and Kate Middleton but, royalty aside, it symbolises many things to many people. When Prince William and his bride walk down the aisle of the famous medieval church in London next year, their royal footsteps will echo down the ages. No fewer than 38 kings and queens have been crowned there in an unbroken run since 1066, and it is the final resting place of 17 monarchs. The royal association began with Anglo-Saxon monarch Edward the Confessor, who built the Abbey in the 11th Century on the site of an earlier 10th Century monastery. He was buried there in 1066 - a tradition that lasted into the 19th Century - and in the same year on Christmas Day, William the Conqueror became the first monarch to be crowned at the Abbey. In fact, the church is better known for burials than marriages. The 1997 funeral of Diana, Princess of Wales, gripped a nation and, for many people, the image of Prince William and his family walking behind the cortege of his mother is the abiding image of the building. 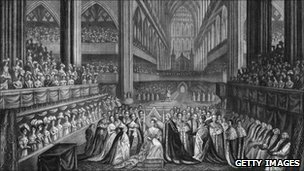 Royal weddings at the Abbey are a 20th Century phenomenon, according to Richard Jenkyns, author of the book, Westminster Abbey. He said: "The tradition had been for quite a long time that the royals would get married at Windsor or the Chapel Royal at St James's Palace. "Having a royal wedding on such a grand scale was quite an innovation." When Princess Patricia of Connaught, granddaughter of Queen Victoria, married Alexander Ramsay in 1919, it was the first royal wedding there for 650 years. Then in 1923, Prince Albert, the Duke of York (later King George VI) became the first prince to marry there. The Queen also wed there. But beyond royalty, the Abbey has other deeply poignant associations. On 11 November 1920, the remains of an unidentified soldier killed on the European battlefield of World War I were brought from France to be buried there. The grave of the Unknown Warrior forever stands as a powerful symbol of war - representing all who fell and continue to fall. For others, the Abbey is the place where famous thinkers, prime ministers, industrialists, scientists, writers and actors are laid to rest or commemorated. 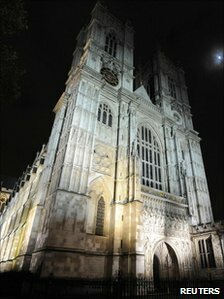 Westminster Abbey's website lists 290 well-known figures through the ages, but says they are only the most famous. The monuments and tombs tell the story of the men and women whose lives formed and changed British history. In 1400 the poet Geoffrey Chaucer - author of the Canterbury Tales - was buried in what has since become known as Poet's Corner. Charles Darwin's grave is near Sir Isaac Newton's - alongside the great and the good spanning more than 1,000 years. The Abbey is known as a "Royal Peculiar" - which means it belongs directly to the monarch, not to a diocese or province of the Church. Its formal name is the Collegiate Church of St Peter, Westminster and it has been called "the parish church of the world" because of its strong historic links with Europe, the US and the Commonwealth. The present structure was started by Henry III in 1245 and has a capacity of about 2,000 - although during the Queen's coronation tiers and galleries were installed to seat 8,200 people. The building is considered one of the UK's most important Gothic buildings, housing treasures including paintings, stained glass, pavements, textiles and other artefacts. The library contains important collections of archives, books and manuscripts and a place to study them. During World War II, immovable treasures and tombs were protected by about 60,000 sandbags, and tapestries, gilt bronzes, statues and manuscripts were removed to country houses for safety. 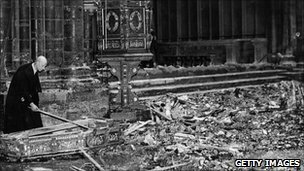 However, stained glass windows were blown out by a blast in 1940 and, in May 1941, fire bombs fell on the roof and in the precincts, burning beams and melting lead. The Abbey remains a church of active worship, with daily prayers as well as a number of services throughout the year to mark anniversaries and special occasions. None, currently, will be more eagerly anticipated than the marriage of Prince William and Kate Middleton.